The GapVax MC Series unit, Combination JetVac, is a wet-only machine, equipped with a unitized water and debris tank and double sub-frame. Heavy-duty double acting single-lift cylinder provides a stable 50 degree dump angle. The MC series is also equipped with an 8' front-mounted, telescopic boom with dual lift cylinders, reaching 26' with a 180 degree rotation. With a wide variety of sizes available, this is an ideal candidate for any size municipality, water and sewer district, or contractor who is cleaning storm drains, catch basins and/or sewers. GapVax offers a single-axle and a double-axle model. The smaller Combo unit gives you the choice of a 4-8 cubic yard debris body and a water tank capacity of 500-1,200 gallons. 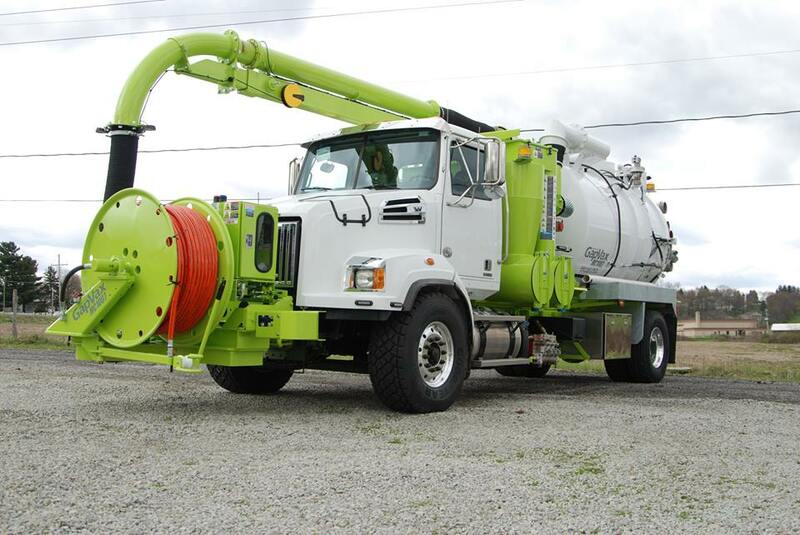 The Double Axle MC allows for a 8-13 cubic yard debris body and water tank of up to 2,000 gallons. Our custom-built units allow for various configurations to make for happy customers. In operation, vacuum conveys liquid material, sludge, rocks, gravel, sand, etc. through the Vacuum tubes and Boom 1 into the Debris Body 2. The material is top-loaded into the Debris Body where the majority of the debris drops out of the airstream 3 due to gravity and air-flow velocity reduction. A Debris Body Inlet Diffuser is also incorporated to direct material from the airstream. A 12" automatic stainless steel Floatball 4 is built in to shut off liquids from overfilling the system. The airstream moves into a specially engineered Cyclone Separator 4 to centrifugally force mist from the airstream. The material drops out of the Cyclone and into the Collector Box 6 located directly below the Cyclone. The airstream exits through the top of the Cyclone and passes through a final micro-screen strainer 7 which collects any material remaining in the airstream before it enters the Vacuum Pump 8. The airstream passes through the Vacuum Pump and exits through the special noise-atenuation Silencer 9. Air returned to the atmosphere is clean and free of particulates. Water is stored in the stainless steel Water Tank 1. The filtered water enters the water tank via Water Fill, which is filtered through a 300 micron water filter 2 before entering the water tank. High pressure water from the Water Pump 3 is directed to the Front Hose Reel 4, the Body Flushout System 5, or the Handgun. Precise control of water pressure and flow is accomplished with the Multi-flow Valve 6 via the Multi-flow Control Valve located on the Operator Panel in the Front Control Box 7. Where do you want the strobe lights? How many boom work lights? How many rear work lights? How many pump compartment work lights? What kind of work lights? How many Super LED flashers? What kind of rear arrow light? What kind of Tube Rack? Two full-color touchscreens that offer the operator visual monitoring of all operating functions and one touch operations. System alarms and interlocks allow for safe and efficient operation. Also supports remote vehicle diagnostics. Someone will be in touch with you shortly! Please check your junk email folder for receipt. Who can we send the quote to?